Planning your BIOMEDevice conference schedule? 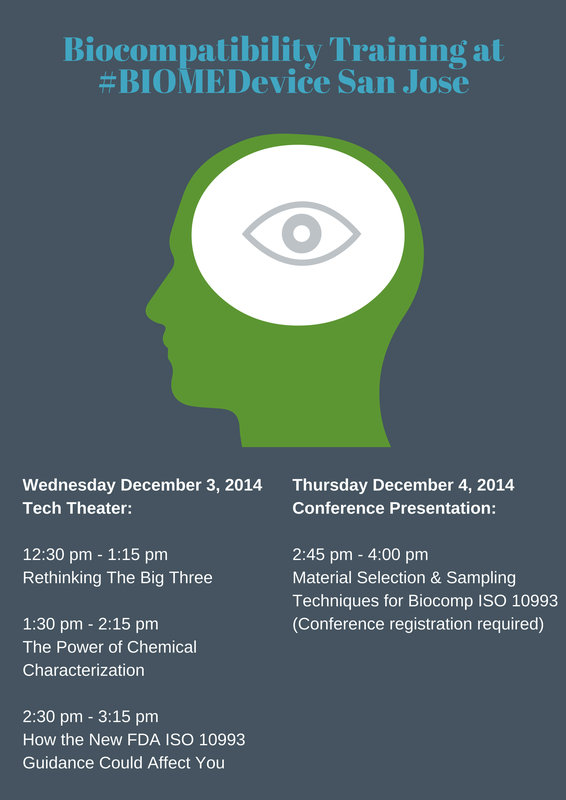 Be sure to leave room for Nelson Laboratories, Inc. Nelson Labs will be offering a full schedule of biocompatibility focused lectures at BIOMEDevice San Jose, December 3 – 4, 2014, while also exhibiting in booth #321. Bob Michaels’ recent Medical Product Manufacturing News (MPMN) Q&A interview with Nelson Laboratories’ biocompatibility expert, Thor Rollins, provides a sneak peek preview of the topics to be discussed in Rollins’ upcoming BIOMEDevice lectures. The following are excerpts from Mr. Michaels’ article, What Types of Biocompatibility Testing Do You Need To Perform? Visit qmed.com to read the complete interview. MPMN: Please go into ISO 10993-1 and why cytotoxicity testing is used for screening medical device materials. MPMN: How should a medical device manufacturer decide which tests are most appropriate for a given device? The amount of data required about a material and the depth of the investigation depends on the intended use of the device and the processes used to manufacture it, in addition to its function and how long it will have contact with the patient. Thus, if you have knowledge of the materials that were used to make the device and data about the potential leachable compounds, this information can be used together with a biological safety evaluation to help pool which types of testing are necessary. In other words, you take the history of the history, the processing methods used to create it, and some chemistry analysis and then evaluate all of these endpoints to help decide which testing should be performed to show that the device is safe. Thus, instead of using ISO 10993-1 as a series of checkboxes, you approach the safety assessment of the device scientifically based on several factors. Each of Thor Rollins’ BIOMEDevice lectures is slated to focus on a different aspect of the swiftly evolving biocompatibility testing landscape, providing MedTech professionals the knowledge they need to navigate the challenges inherent in contemporary biocompatibility testing. Mark your calendar for Thor Rollins’ three Tech Theater presentations Wednesday December 3rd, and register for his Conference Presentation Thursday December 4th. To learn more visit www.nelsonlabs.com.